High Leigh Conference Centre is seven miles from the M25. From Junction 25, take the northbound A10 dual carriageway towards Hertford. 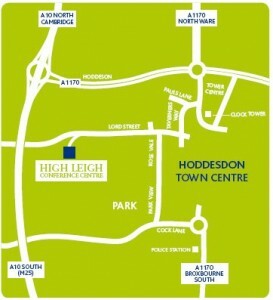 Leave the A10 at the junction for Hoddesdon and follow the road towards the town. At the roundabout take the third exit signed ‘Town Centre’. Turn right at the church into Pauls Lane and bear left into Taverners Way. Take the first right into Lord Street and continue up the hill for just under a mile. High Leigh is on the left. The local Railway station is Broxbourne. There is a regular service from London Liverpool Street, which also connects with the Underground Victoria Line at Seven Sisters or Tottenham Hale. The station is two miles from the Centre, but there are plenty of taxis at reasonable rates (typically £5). Stansted Airport is 40 minutes away by road or a 35 minute train journey from Broxbourne.